It was the best Christmas gift Kristen Cook could receive. 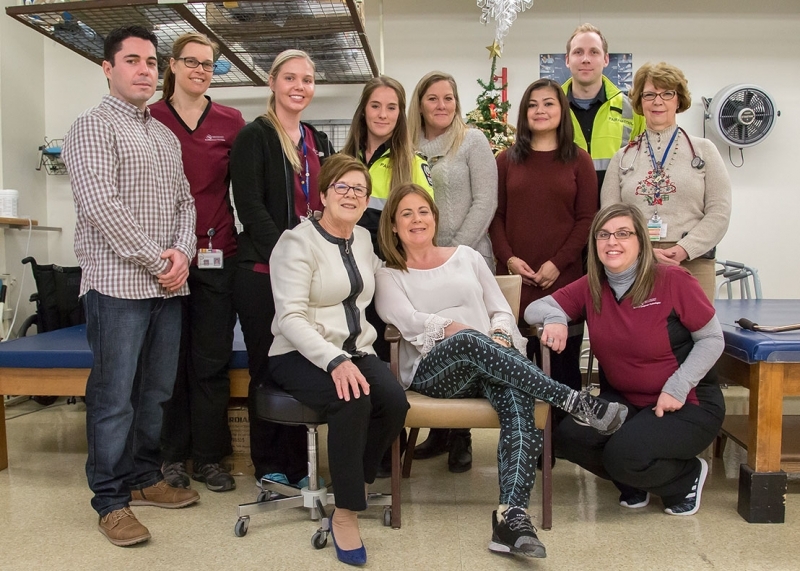 Inside a room at our Greater Niagara General Site this week, she was reunited with the people who cared for her after having a stroke last year. When she walked into the room, Kristen was greeted with a hug from each of the healthcare providers from Niagara Health and Niagara EMS. Kristen, a 41-year-old mother of two from Port Colborne, suffered a stroke last Christmas Eve. She was taken by ambulance to the Emergency Department at Greater Niagara General. After tests showed hemorrhaging on her brain, she was taken to a Hamilton hospital where she stayed nearly two weeks, including time in the Intensive Care Unit. 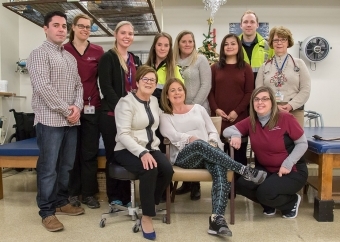 She returned to the Niagara Falls hospital, where she was cared for by Niagara Health’s Stroke Centre team for a week. She then spent three months at Hotel Dieu Shaver Health and Rehabilitation Centre in St. Catharines to continue her recovery. Kristen was joined by her mom, Colleen, who is a retired Registered Nurse at Niagara Health. Scott Chambers, a Registered Practical Nurse at the Niagara Health stroke unit, was delighted to see Kristen and to witness the progress she has made. “It makes every day worth it,” says Scott. Kristen says the care she received at Hotel Dieu Shaver Health and Rehabilitation Centre was also extraordinary. From Niagara Health: Kyla Michael, Physical Therapist, Jennifer Lamothe, Occupational Therapist, Kathryn Ingebrigtsen, Speech and Language Pathologist, Scott Chambers, Registered Practical Nurse, Tamara Dickison, Registered Practical Nurse, Dr. Dirgham Al-Jarrah, Marie Rusnak, Nurse Practitioner, and Angela Ting, Registered Nurse.